There are over five billion searches performed on Google every day. Are you appearing under the correct search results? When implementing an ad campaign, it is imperative to fully understand which search results you want to appear in and which ones you want to steer clear of. How do you ensure your money is well spent? By using keyword match types correctly. Keyword match types are rules that pertain to how a keyword is treated when entered into a search engine. There are five different match types and each one will broaden or narrow the results. Understanding the role each match type plays and how they can impact the keywords you are using, whether you are creating a website, AdWords campaign or Amazon listing, will allow you to run a more successful campaign by targeting necessary parameters and siphoning off irrelevant traffic. 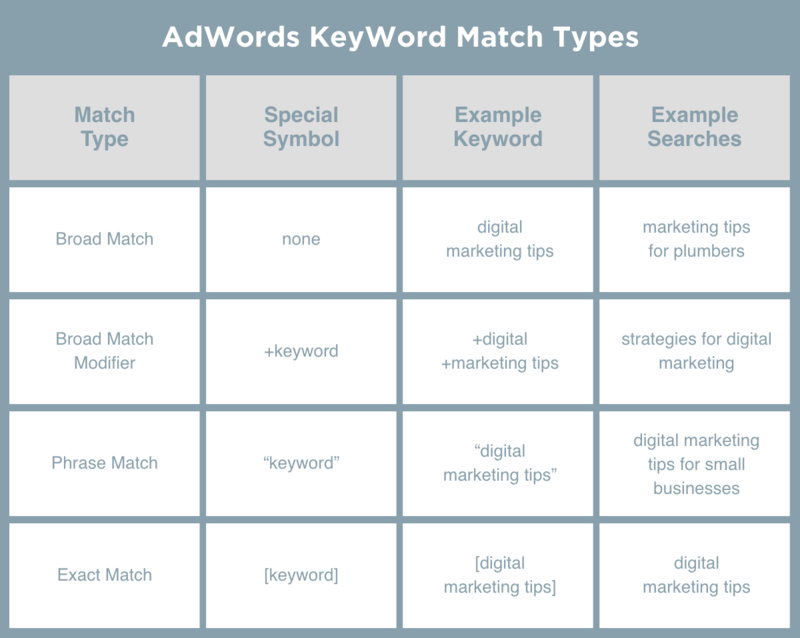 When comparing the types of keyword matches, broad match casts the widest net. Selecting broad match type will ensure a search will pull up all results which contain any of the words in your keyword. If your keyword is digital marketing tips and you target it as a broad match you can expect to appear in search results ranging from marketing tips for plumbers, to digital computers, and even something as off topic as steak tips. Someone who is searching for digital marketing tips is not going to have any interest in pursuing a site that is selling steak tips. And the site that is selling steak tips is not going to have any luck converting the visitor who is looking for digital marketing tips. Broad match type can be a useful tool when you are at the beginning of your ad campaigns. You can use broad match to see what keywords are cultivating the most clicks. Broad match is also good if you are advertising for a generalized product or industry. For instance, if you sell all types of shoes and boots, and your keyword is men's winter boots, it would be okay for your ad to show up when a user searches for women's boots. A more refined match type is the Broad Match Modifier which is indicated by adding a “+” in front of one or more words in your keyword. Your ad will only appear when a user’s search contains the word/words that have a “+”, though they can be in any order. Let’s use our same example but this time we set our parameter as Broad match modifier for the keyword +digital +marketing tips. Our ad will now appear in search results such as strategies for digital marketing, digital marketing success, and marketing in the digital world. Broad match modifier is great for getting the most out of your long-tailed keyword (a keyword that has three or more words). For example, if your product is winter boots and your keyword is best boots for a New England winter, adding the broad match modifier to +boots and +winter will ensure your ad appears whenever a user search contains both winter and boots. To further narrow down the searches your ad appears in you can implement the Phrase Match which is utilized by quotations. Your ad will only appear when a user searches a keyword in the exact order you specified, though can include words in front or after your keyword. Continuing with our example, implementing the phrase match for the keyword “digital marketing tips” will enable your ad to appear when a user searches 10 best digital marketing tips or digital marketing tips for small businesses, but will not appear when 10 tips for digital marketing is searched. Phrase match is best used when you are targeting a very niche keyword. If you sell tall boots for men and women and your keyword is “tall boots”, phrase match will ensure you don’t appear in results for short boots, but will appear in a search for men’s tall boots. The narrowest match type is Exact Match, denoted by brackets. This will enable your ad to appear only when a user searches for your exact keyword. Example, if your keyword is [digital marketing tips] you will only appear in the search results when a user searches digital marketing tips. You also will not match to any queries that have words in front or after your keyword, [digital marketing tips] would not appear when best digital marketing tips is searched. Recently, an allowance to return results with slight variations: misspellings, abbreviations, function words, and reordering, has been added. For example, your keyword [digital marketing tips] would still appear in a search for digital mktg tips. Exact match should be used when you want complete control over when you appear in search results. If your ad campaign is for leather boots, enacting the exact match will ensure your ad does not appear when a user searches sheepskin boots, but will appear when a user searches either leather boots or laether boots (same keyword but one is mispelled). The Negative match can technically be broken down into Negative Broad Match, Negative Phrase Match and Negative Exact Match. In essence, it applies the same rules as each match type but specifies what keywords to NOT search for. Negative keyword match types can be extremely useful in eliminating unnecessary results. If you were running an ad campaign for men’s shoes and you did not sell any shoes for children, it may be beneficial to use negative exact match for [kids shoes] or [children’s shoes] to ensure you don’t show up in the results for someone searching for kids shoes. Match types are utilized in many different ad platforms, but one notable difference appears between Google and Bing. Bing keyword match types are very similar to keyword match types in Google, however, there is a difference in the way in which phrase match is utilized. Google phrase match will only return results if the keywords are in the exact order. Bing takes a little liberty and will show results with the same words in a different order if they feel the keyword has the same meaning. For example, your keyword “wonderful marketing tips” will appear under a search for amazing marketing tips. Different match types will determine when your ad will appear in a user’s search. This is critical in driving the CORRECT traffic to your page. By selecting the best keyword match type for your keywords you can have control over the appearance of your ads and avoid appearing in irrelevant search results. Understanding this relationship and choosing and implementing a keyword match type strategy for your selected keywords is critical in your ad campaign success. Feeling overwhelmed with deciding what match type will yield the best results for you? Contact us! Our team specializes in keyword selection and match type utilization.